This is another one of the crafts we did at MOPS, and I wish I had brought my camera to show you all the cool ideas the ladies came up with. 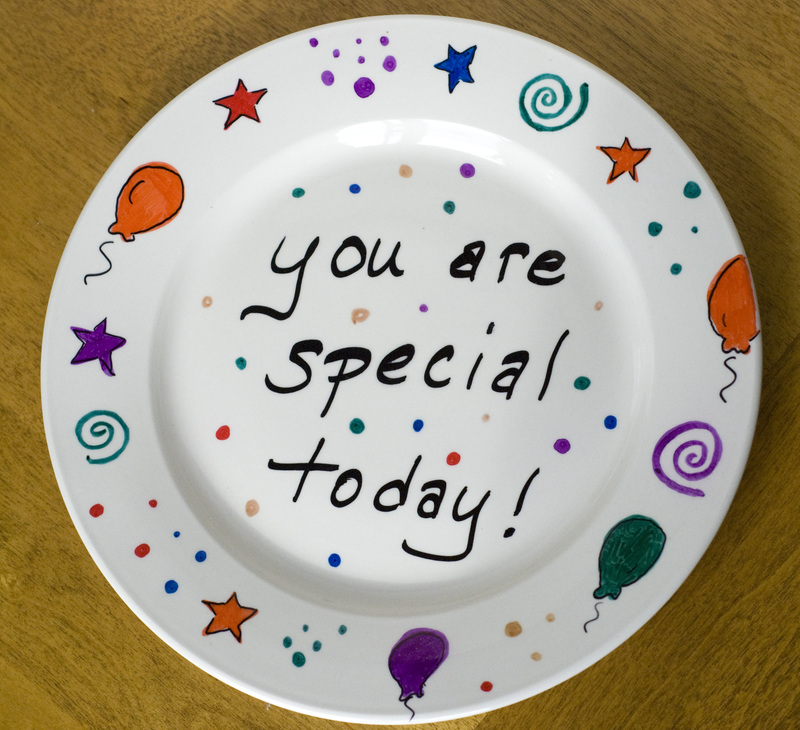 You could write any saying or use any drawing or simply use the plate even as a great way to remember a special day by having everyone sign it at your party! The possibilities are endless. I’ll try to list a few, some links for picture inspiration and tips. I thought these would be cute for Christmas cookies and if you wrote down the recipe on the plate and wrapped it up with cellophane with the cookies on top. Or, I heard one family that discussed each other’s day using the plate. The person with the worst day got the special plate for dinner or something like that. 2. Write the child’s name and date of the birthdate. 3. Use an initial in the middle and family members around the edges. 7. Draw blank faces. Then, you can put orange or apple slices around them for the hair, marshmallows for teeth, etc. 1. Try to sketch it out on a piece of scratch paper first. Even the writing part. 2. Try to avoid using yellow permanent marker. I am not sure if it was the sharpie brand or the fact that it was yellow, but the yellow markers all dulled to a muted gross yellow color after the plate was finished. 3. Some people have put these plates in the dishwasher successfully. If you want to cherish it and use it often, of course handwashing is probably best. We were also handed the cheap, clear plastic disposable plates to put on top of our plate – just so someone didn’t accidentally chip the art with the fork. 1. Make sure the plate is clean and dry. 2. Decorate using permanent markers. 3. Put the plate in the oven and turn it on to 350 degrees. Let the oven heat up and then bake it for a total of 30 minutes. Remove plate and cool. We used a birthday plate with my children for years and years. It was something they looked forward to and wouldn’t let me forget to use it on their birthday. We also have two special plates that my children made in preschool. I think they were meant to be used each Friday night when we celebrate the sabbath. The plates were made when each child was about 3, and show a drawing ( stick figures mostly) made by each child of our family. I cherish those plates. This is a wonderful idea.